It became obvious that we would need to hire a car to be able to do anything extensive in the way of sightseeing and finally, at the last of 10 car rentals, found one. It cost $60 per day with 100 free kilometers, and a $.25 charge per extra kilometer. I thought we would be able to do the trip within the 200 kilometers (silly me!). We rented a Japanese made 4 wheel drive station wagon (that should have warned me). However as we were renting the car, I looked in the local Marlborough County phone book, and listed were several people with the Slape surname, one of whom lived in Picton. After a coffee on the main street, I went to see these Slapes, and then we went to Blenheim, the county seat of Marlborough County. (The story of the Slapes is told on other pages in this trip log). The drive to Blenheim was pleasant on a very driveable road, through a couple of valleys with moderate sized hills on either side, at the eastern end of the Richardson Range. Bleinheim, itself is located in the Wairau River valley on the south bank of the river. It is town of about 25,000 population, located in the center of the world famous Marlborough County wine region. 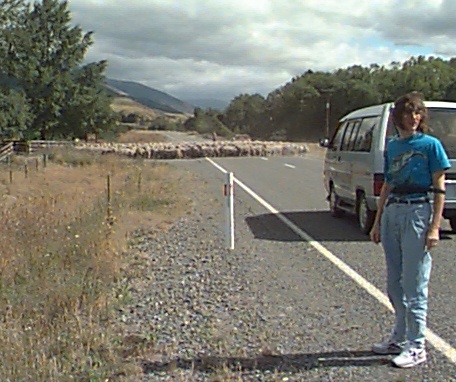 We spent a couple of hours here, had lunch in a Scots cafeteria (where my request for Scotch eggs was at least understood, if not satisfied) and then took to the road again to head westwards up the Wairau river to St. Arnaud. This was an interesting trip, most of it in a flat, gently rising valley, with straight roads which were easy to drive on. The view on the right, to the north, was of the Richardson Range of hills which rise to about 1800 meters. I was overcome by allergies at this point in the trip (I have been having quite a bit of difficulty with the pollens in New Zealand) and so we decided to find a place to stay for the night. St. Arnaud has a population of probably 300 or so. It is center for tramping and skiing, but the very few motel rooms available were taken by a wedding party and I was not keen on the accomodation available for itinerant trampers. Tophouse was established in the 1850-60's time period in the earliest days of New Zealand colonization. 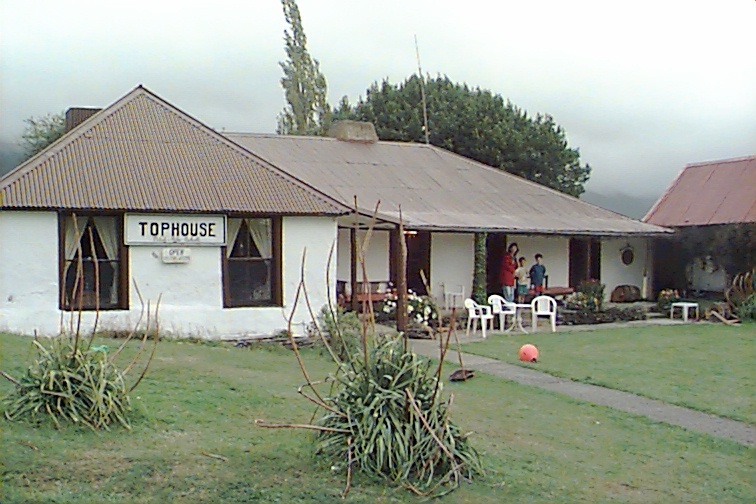 Tophouse is an historic farm, which has been a hotel and bar for most of its life. It is of cobb construction (a mixture of mud, straw, manure and cement) which had fallen into disrepair until Mike and Melody restored it over the past few years. Besides its early start, it is also known for some dramatic murders that occured there in the 1880's. I know our bedroom door opened, seemingly by itself, at least once during our stay, so I guess the ghosts are still there. We had a delighful stay at Tophouse. It was interesting to talk to Mike about the farming in that area. They are located at an altitude of about 1,000 meters. The night before they had a mild frost and Mike said that they have had frosts in every month of the year. It is therefore impossible to grow most crops, although, on his 700 acres he did have a field of turnips (which are greatly appreciated by the rather large rabbit population). Mostly he raises cattle and he has about 100 head. Like cattlemen everywhere he is at the mercy of the market prices. Five years ago cattle averaged about $560 a head and now they are down to about $100. However prices have been rising, now in the fall of the year when they would normally drop, and he is optimistic. We had dinner with Mike (whose original ancestors in New Zealand arrived by boat from Scotland in the 1840's) and Melody and their two sons Karl and Jared. The boys go to a school which has 29 pupils, the greatest number in recent years. Karl is fighting with problems with the "A" drive of his computer which only goes to prove that there are no havens from computer glitches. The next morning, at breakfast, Christine learned how to cook toast over an open hearth fire -- in response to her question of "where's the toaster". 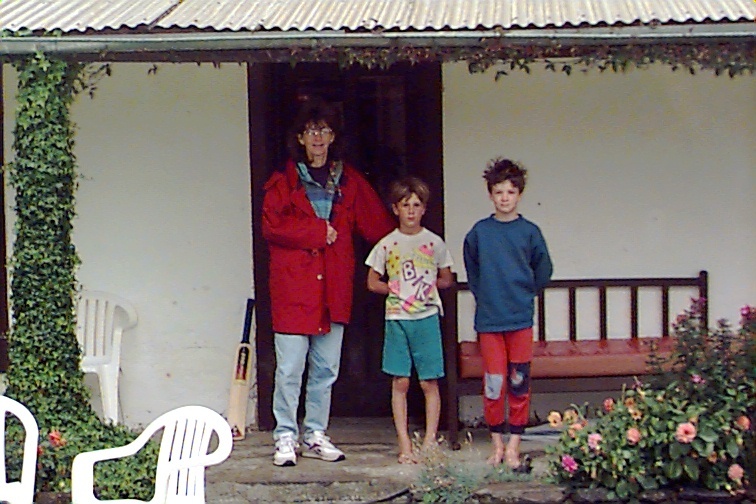 Before we left I took the following photo of Christine with the two boys. photo. I told them I would put this photo on the website and they said they would look for it at school where they have access to the internet. 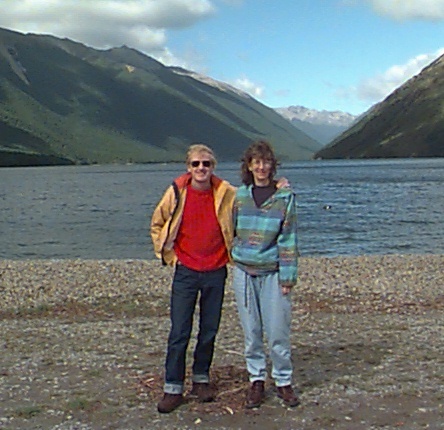 From Tophouse we returned to St. Arnaud and visited the nature preserve at the north end of Rotoiti. Here we walked around a small peninsula that juts into the lake. It was a lovely walk, and different from others that we have taken in that it was fairly level (except on the way back where we had a small climb over the peninsula to return) and for the large number of birds that we encountered. We have generally been amazed by the lack of wildlife in New Zealand. There are few native species (no snakes to speak of, no mammals other than three bat species, almost no insects, etc.) and even the birds seem to be scarce. But on this short walk (a couple of kilometers) we were in the midst of birds. For me, the most striking was the tui bird which we observed singing for several minutes. It has an incredible range of sounds and reminded me of a Bartok symphony I once heard. We also saw fantails, the NZ robin and Australian black swans as well as several other birds. The only disturbing thing on this brief visit was the appearance, as we were leaving of a couple of groups of people with powerful motorboats who were setting up to go waterskiing. It seems such a sadness to disrupt the tranquility of this lake (one of the few in New Zealand) with such activity. We asked one of the boaters to take a photograph of us without the dock and boats in the background. He, of course, included them, but with the aid of the photographic software I have cropped them out of the following photo. It reminded Christine and me somewhat of Lake Louise in Alberta before the tourist infiltrations of the 60's and 70's. Pushing on from St. Arnaud, we returned north, past Tophouse, and proceeded to Nelson. It is lovely town on the north shore of the South Island, in Tasman bay. To us it is best known as the area were Lord Rutherford, the physicist, was born. We didn't have time to visit the commemorative center that has built in his honor but we spent a couple of hours in Nelson, itself. Nelson is a slightly larger town with a population of about 40,000. It prides itself in being the sunniest spot in New Zealand. When we went through the Anglican Cathedral, Christine pointed out the plaque in honour of the valiant Englanders who withstood the fury of the Luftwaffe attacks in WWII. She felt my heroism had finally been 'recognized'. We then made our way along the coast back to Picton, to take the ferry to return to Wellington. This was a "scenic" drive. That is a New Zealand word which describes a road that has hard turns every 50 meters, clings perilously to the side of steep hills, which is one lane wide, which is used for two directional traffic and which has a speed limit of 100 kph (at which speed which most New Zealanders try to drive). The driver sees nothing other than the road. The passenger, if imbued with the correct sense of confidence in the driver, has a spectacular view. However, the passenger who feels a great need to see impending doom has as terrifying a trip as the driver. At one point on this section of the trip we passed a quaint arrow sign which said "Outward Bound School". It was obviously misplaced -- it should have been located at the airport arrival gate, in Auchland. We returned the car in Picton. We had driven 360 km, so the total cost was $160 plus $30 for gas for the car -- a bit pricey, but we certainly covered a lot of territory in the two days. We then caught the slow ferry back to Wellingnton. It was crowded with true trampers -- people heavily laden with backpacks, sleeping bags, etc. Many were speaking a number of European tongues, and were obviously just coming down from a 'high'. The trip on the ferry was almost four hours -- I think a next trip will be strictly by Lynx. . . .And the walk home only took 15 minutes.